Visit a Holiday Light Display To Celebrate the Season! Baking decadent cookies, decorating the house with Christmas trees, and hosting holiday soirees; these are a few of the best ways to celebrate the season. If visions of burnt gingerbread men and high-maintenance family members dance through your mind when you think of these holiday traditions, there is a stress-free and festive way to get in the Christmas spirit that might be better suited for you. 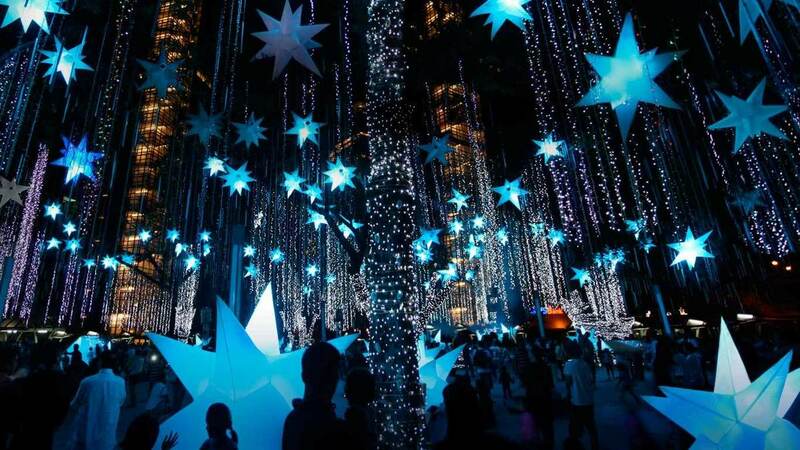 Throughout the US, there are a plethora of holiday light shows that provide you with the perfect, worry-free way to feel festive this holiday. Most states have at least one display of lights and decorations that are set up each year for families and friends to enjoy, but the lucky states have several throughout. These displays draw in crowds from all over and can range from millions of individual lights combined into one spectacular display to a single Christmas tree made of tumbleweeds. No matter which display you choose to visit, they are all wholesome activities that are perfect for the entire family. The kids will be dazzled by the twinkling lights and fairy-tale-like displays while the adults will be reminded of the magic of the season. Although many of these light shows are worth a visit, there are some that stand out as being the most extraordinary. They’re scattered across the US from Washington to Alabama. The elves at Treetopia put together a map highlighting the ten best displays. Each of the shows has their own unique elements that locals have grown to love. Whether it’s a display of thousands of collectible Santa Claus figurines or a lake cruise that leads to a breath-taking display of holiday lights that makes the show stand out, none of the top ten will disappoint you if you pay them a visit. Some people say that you haven’t really felt the real holiday spirit until you take a look at these professional shows and displays. Regardless of what you celebrate, visiting a holiday light display is the perfect way to celebrate with your loved ones. These shows are innocuous and don’t focus solely on one religious tradition. For instance, the Tanglewood Festival of Lights has a large light display that reads “Happy Hannukah” and another that wishes everyone a “Happy Kwanzaa.” No matter what you believe in and what you do to celebrate the season, these light displays are a harmless and beautiful place to spend an evening during the holiday season. If you plan to spend the holidays near one of these featured light displays, we highly recommend stopping by for a visit with your family. Pack a picnic with some of those aforementioned gingerbread cookies (as long as they aren’t too burnt) and make a road trip out of it. Even the biggest Scrooge of your family will find themselves smiling at the extravagant displays. We guarantee that no one will be disappointed and you will leave feeling a little more festive than you did before attending. And lastly, remember to always stay safe and be careful with all the celebrations around. Take care of what you eat and drink, try to eat as healthy as you can, stay hydrated and avoid hangovers. At home, if you decided to have an artificial Christmas tree, please make sure it’s labeled “fire resistant” but if you bought a natural tree, just keep lit away from heat sources and check the water level every other day to ensure proper hydration ( because we know that a dried-out tree can catch fire faster). Enjoy your Holidays! “The holiday season is a perfect time to reflect on our blessings and seek out ways to make life better for those around us”. -Terri Marshall.